The Pan-American Health Organization (PAHO) works as a Regional Office of the World Health Organization (WHO) for the Americas and as a specialized institution of the Inter-American System of the Organization of American States (OAS). In Brazil, besides its Representation, PAHO has two additional offices: the Latin-American and Caribbean Center on Health Sciences Information (BIREME) and the Pan-American Foot and Mouth Disease Center (PANAFTOSA). PAHO/WHO Brazil, with Dr Joaquín Molina as its Representative, BIREME with Dr Diego González Machín as its Director and PANAFTOSA with Dr Ottorino Cosivi as its Director, work in tune and in coordination with the country´s health-related priorities, considering that their respective projects are made feasible by means of Terms of Cooperation formalized with the Brazilian government. In the scope of BIREME´s work in managing health information and knowledge, PAHO Brazil effectively supports the Center by formalizing its institutionality in the country, which historically has had support for maintenance and development from the Ministry of Health. Moreover, BIREME enables its participation in Terms of Cooperation entered with the Ministry of Health and its Secretariats, as well as with national organizations, such as the State and Municipality Secretariats. “BIREME represents to Brazil a reference center on scientific and technical information and the ongoing initiatives through PAHO/WHO are helping to strengthen health information systems and developing evidence-based actions” stated Dr Joaquin Molina, PAHO/WHO Representative in Brazil. The scope of one of the Terms of Cooperation, TC-50, is to develop VHL in Brazil by fostering the country´s capacities and infrastructures in scientific and technical information and knowledge, focused on its Unified Health System (SUS, acronym in Portuguese). The VHL Brazil contributes to strengthening the national information policy directed to equitable access to national, regional and international scientific and technical information. In this sense, the VHL develops and expands its field of action by thematic areas, including Nursing, Psychology, Cancer Prevention and Control, Public Health, and others. 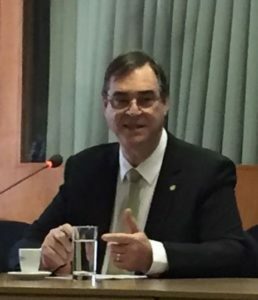 In September 2016, Dr González Machín, Director of BIREME, went to Brasilia to attend meetings at PAHO Brazil and with the Expanded Programmatic Coordination Group. He shared the results accomplished in the context of the Terms of Cooperation led by PAHO Brazil in the country, with which BIREME cooperates with health information management and knowledge. The highlights of the 2016-2017 biennium are: (i) Management of Work and Education in Health; (ii) Development of the Health Technology Management System; and (iii) Expansion of Access to Primary Health Care for the Brazilian Population. Results and current status of projects and developments were presented, generating productive discussions on efficient joint actions between PAHO Brazil and BIREME, as well as about future joint lines of action.